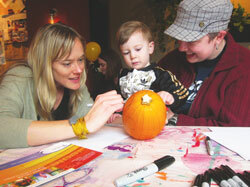 Thrive Art School teacher Carah helps Soren and his mother, Erica Tanberg, decorate a pumpkin during a free event on Oct. 27 at Café Flora, 2901 E. Madison St. Teacher Lauren, also of Thrive Art School in Madison Valley, is in the background. The event also included such fall snacks as pumpkin bread, pumpkin pancakes and spiced cider.